Sea Duck Hunting is rough on equipment and decoys are no exception. We designed the foam filled Commercial Grade Sea Duck Decoy to take a beating and still ride high on the water day in and day out. 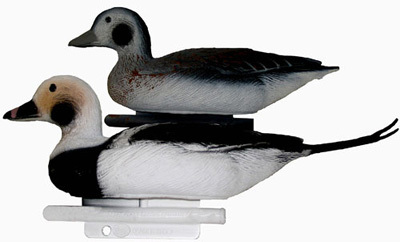 These Sport Plast decoys are the perfect decoy for those sea duck hunters who want a quality decoy at an affordable price. The drake Old Squaw Measures 18 1/2" from beak to tail and the hen measures 15" from beak to tail. These decoys are weighted keel. Drakes only are available.